Colours appear to be back in shabby chic fashion this year. We are certainly painting in colours that we didn’t use last year…proof indeed that it’s a fashion thing. Yes, the creams and the whites remain popular, but so too are greens, blues and beiges. A case in point was this dining room sideboard. It’s destined for a new life in an old cottage by the sea. Very calming. The design need was for a colour complementary with the other furnishings in the room. And so Joa’s White from Farrow and Ball was pressed into service. This is, of course, a shabby chic painting colour of 2013. It’s a distinctive colour in the Farrow and Ball colour range and one that really worked for this shabby chic colour treatment. We needed to give the sideboard only a light sanding as the wood was natural, without a varnish or polish. That made it a lot easier. 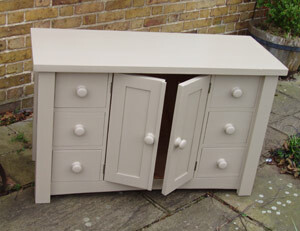 We also found some new wooden drawer and door handles to suit the piece. So we attached these before getting on with the main paint task. We applied both a primer and an undercoat before several coats of the primary colour, Joa’s White. On this occasion we didn’t give this furniture a shabby-chic finish. We kept all the definition of the new paint finish, giving it only a light neutral wax for final protection. It’s definitely a look for some properties right now; hand-painted furniture with a wax finish for added protection. So, just the thing it needed. Over all, this was a satisfying look for a piece of furniture that needed a makeover. 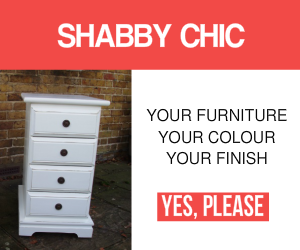 When you are ready to discuss your next shabby chic furniture project, or just want your furniture painted, then please don’t hesitate to get in touch. Because we can always discuss all the options that you have available.